Lightfair showcases the extent to which LED technology is deepening and broadening to cover more ground, more niches, and more uses never before possible, in lighting design and applications. At the same time the center of the market is targeting the largest applications: replacement of sodium vapor in streetlights, fluorescents in the workplace, and incandescents in the home. The Lightfair Innovation Awards, announced yesterday evening, reflected this dual nature of the market. Most Innovative Product of the year went to a fluorescent replacement product suitable for offices, educational settings, retail, and healthcare. The Technical Innovation and the Judges' Citation awards were given to products that do things that were impossible before LEDs. The Most Innovative Product of the Year was the BoldPlay architectural LED luminaire from Philips (sponsor of this site). Intended to replace fluorescent lighting or for installation in new construction, BoldPlay operates at 106 lm/W and delivers even light that makes possible the spacing of units up to 20 feet apart. The product's simple, clean design was cited in the award. It incorporates "a low profile Light Guide Panel which helps extract and reflect light into a precisely controlled direct/indirect distribution," according to the press release, and uses patented nanotechnology to control high-angle glare while tailoring the light spectrum for comfort. An optional daylight sensing unit can reduce power consumption without external controls. The Design Excellence Award went to Cooledge Lighting for its LED Light Sheet. 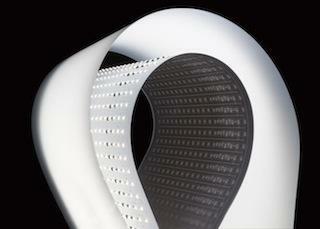 This flexible fabric is mountable on any surface and requires no heat sink. It comes in widths from an inch to a foot and in lengths up to eight feet. Clearly, light in such a flexible geometry enables the creation of luminaires that could not be imagined using older technology. The Judges' Criterion was awarded to Philips (again) for the Hue personal wireless lighting system, which we covered in March. It allows control of home lighting brightness and color from an iPhone or iPad. Think of Hue as a leading indicator of the home automation that is just now becoming possible, and that would have been unthinkable with incandescent lighting. Here are a couple of other highlights of a day spent roaming the expansive show floor at Lightfair. Cree, the first company to offer a mass-market incandescent replacement LED bulb for under $10 at retail, was showcasing new products intended to replace fluorescent troffer fixtures. Its HE (high efficacy) line claims to achieve 130 lm/W at a CRI of 90, and the HD (high definition) products have 80 CRI but with the addition of a high R9 rating for better color definition at a reduced price. 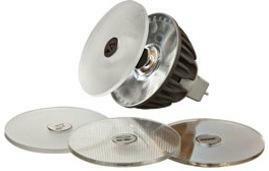 Soraa, which we mentioned briefly this week for its GaN-on-GaN technology, was showing off its patented SNAP System, whereby interchangeable (and stackable) filters attach magnetically to an MR16 lamp with a 10-degree beam. Numerous filters are available (and more to come) for beam shaping, spectrum shifting, diffusing, etc. A spokesman said the filters impose a penalty of around 10 percent; he implied that all the company's spotlighting products would be moving to the SNAP technology as losses are further reduced and source intensity increases. Soraa was featuring a spiffy demonstration of its claimed "full spectrum" light sources. Visitors could pick up a hand-held analog spectrometer and point it at any available light source. The sodium lamps in the high-bay show space were a popular target: The choppy nature of their spectra was immediately evident. Soraa's MR16 sources did exhibit, as advertised, a uniform spectrum across the visible range. A cheap and effective demonstration. We'll have much more from Lightfair in the coming days, including video from the show floor. Stay tuned.